Downtown's nightclub scene is mushrooming. There's the grungy Sports on Congress, which has shifted its focus from chicken wings and football to music, introducing hip-hop and industrial-themed dance nights. Centro, a posh lounge, offers house music and cocktails on an open-air brick patio. Sharks Nightclub mixes hip-hop and billiards. Vaudeville Cabaret, which calls itself "Tucson's only punk bar," draws crowds with hip-hop on Fridays. The Red Room at Grill hosts a rotating cast of singer-songwriters, and then there's the granddaddy of them all, hipster haven Club Congress. Now comes a new, sparkly jewel for downtown's late-night crown. Open only a month in the space that used to house Asylum, an industrial club, Zen Rock has become a hot spot for Tucsonans to see and be seen. On Saturday nights especially, the line for the club routinely stretches around the block. Luke Cusack owns Zen Rock, and he's brought a more minimalist approach to his newest venture — at least compared with his other club, Pearl, which boasts bar tops adorned with half a million pearls. Zen Rock's color scheme is dominated by red and black. The waitresses wear crimson tops with short black skirts. The walls are painted red with black molding. Tabletops are decorated with tea lights in small red glass votives. Allison Stallard, 22, is a server at Loews Ventana Canyon Resort and has been to Zen Rock twice. "I like it because you have separate rooms for different atmospheres," she said. Zen Rock has three levels. Walk through the club's doors into a room with limited seating an a large bar. A larger adjoining room is filled with laser lights and fog, as well as poles for exotic dancers and swings that dangle from the ceiling. Girls in short skirts sit on the swings and kick their legs for the entertainment of the crowd below. A set of stairs leads up to the VIP room, and another set descends to a basement where customers can escape from the loud music. The basement's brick walls are painted white, and the ceiling features exposed wood beams. There is a large bar and several red couches that customers can reserve for a fee. On a recent Friday evening, Sean Kingston's "Fire Burning on the Dance Floor" and a dance remix of Michael Jackson's "Billie Jean" played upstairs, while four guys stood around a small table in the basement and clinked glasses filled with Patrón tequila. Damian Hernandez, a Canyon Ranch therapist, says he likes Zen Rock because "it's got a bit of the L.A. flavor with a Vegas twist." Hernandez's neighbor, Noah Lerman-Simms, 26, says, "I like this place because there's a lot of good music." "And the girls here are nice," Hernandez, 33, adds. "They know how to dress." The music at Zen Rock is electronic dance and rock 'n' roll remixes. "We're flying in (DJs) from Vegas left and right," Cusack says. Last weekend, Johnny Vegas spun records. He's a local guy. At the back of the club is an open-air lounge with a bar where smoking is permitted. Between puffs, Catherine Strickland, a Sonic Drive-In carhop and nursing student from Clearwater, Fla., says she likes Zen Rock's vibe. "People like to come dance at this place because they mix all types of music," she says. One frequent complaint: When the club gets crowded, lines at the bar get too long. One comment on the club's Facebook page said about Zen Rock's opening night, "It was cool but need faster BARTENDERS (some were good) and more than just one credit card machine behind the bar!" "We've added more credit card machines," Cusack says. "And we've got two more bartenders downstairs." A few club-goers also complained that it took too long to get inside the club, and one guy in brand-new Chuck Taylor All Stars was unhappy when he was turned away because he didn't conform to the club's dress code (no sneakers allowed). For the most part, Tucson has rushed to embrace this new downtown nightspot. "We've made a good 75 percent above our predictions," Cusack says. So what's next for Cusack? The notoriously restless club owner plans to open a steakhouse downtown in the fall. And he's already at work helping to open Sapphire, an ultra-lounge. Cusack, who has been hired as a consultant, says it will open in about a month downtown in space formerly occupied by Heart Five. "Sapphire is going to be very spectacular," he says. 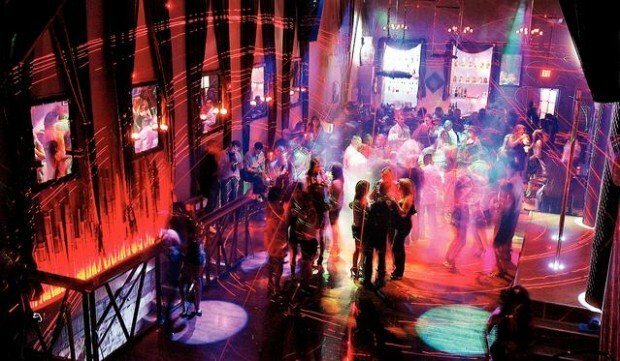 • What: Zen Rock, a new downtown nightclub that features electronic dance and rock 'n' roll remixes, plus go-go dancers. • Where: 121 E. Congress St.
• Hours: 9 p.m.-2 a.m., Thursdays through Saturdays. Landlords lock out Sapphire Lounge for failing to meet lease agreement.